← Science of Persuasion – simple steps via cool animation! In the world of analytics, social media and digital revolution, there is one age-old concept that companies still struggle with – CHANGE. Having worked with over a dozen clients, most of which are Fortune 500 companies, I have learned one thing – its much easier to change technology but difficult to change human behavior. Take for example. A well-known company, like many others, is going through some turbulent times and wants to manage cash flow very carefully while continuing to service their customers well. All executives are aligned on the common goal. However, when it comes to executing the plan, you cannot get anyone to agree. Business units don’t want to “shake up things” too much, IT wants to protect the aging systems and Finance doesn’t want to pay for anything risky. Yet, everyone is aligned on the common goal of “managing cash flow”. Another example that comes to my mind is from several months ago. A client wanted to expand operations in Asia and had the right business case, brand recognition, market support and skillsets to do so. In this case IT, Finance and Corporate Business were all in agreement and ready to execute. However, the country general manager was not in favor and his rationale was that growth would be too fast to sustain. His real reason, that we found out later, was that this change would have lessened his authority with a regional business model. It is not uncommon to see this kind of resistance to change in most companies. Everyone wants to adapt to changing market conditions and customers but when it comes to self-change, many transformation initiatives fail or run into significant roadblocks. This brings us to the point on how to manage change. Some of the lessons I have learned along the way from my own experiences and from some of my colleagues. First, Find the Nay Sayers – there will always be some. In the early stages, there are more. Key is to identify them quickly and try to neutralize them early on. There are always some left but try to maximize the ones on the positive side. Second, Get to the Real Issue – like the country general manager in the example above. When we were able to understand the issue behind his position, it was easier to develop an alternate model that would address his authority concern while launching the expansion plan. Focus on people and their concerns. What they say or do is often a cover. Third, Create a Spark – in the first example where Business, IT and Finance were all resistant, it was very difficult to get anything started. In one of the meetings we brought their projected income statement showing negative cash flow in subsequent quarters. Their future was in front of their eyes. Message was clear and it sparked the need for change. Fourth, Respect everyone – change is not about organizations or systems or cash flows. It’s about people. If we get the right buy in from people at all levels, change will be successful. So, however long it takes, listen to everyone and try to address as many concerns as possible. Don’t disrespect or stomp on people. Carry them along! Last one for this blog, Have the right Leader – this is not something new. 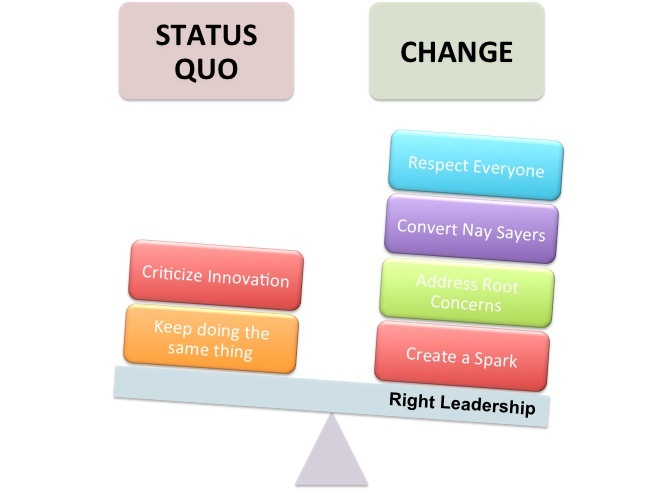 Lack of a change leader will impede the progress. Nominate someone who represents the change, lives it, practices it and preaches it. We all look for role models in our personal and professional lives. Elect the most common role model for your change! In the dynamically changing socio-economic market conditions, make CHANGE a weapon to be more competitive! This entry was posted in advocacy, analytics, behavior, change management, leadership, management, productivity, thought leadership and tagged behavior, change management, consulting, digital revolution, human behavior, leadership, management, org behavior, organization change, social behavior, social media, thought leadership. Bookmark the permalink.